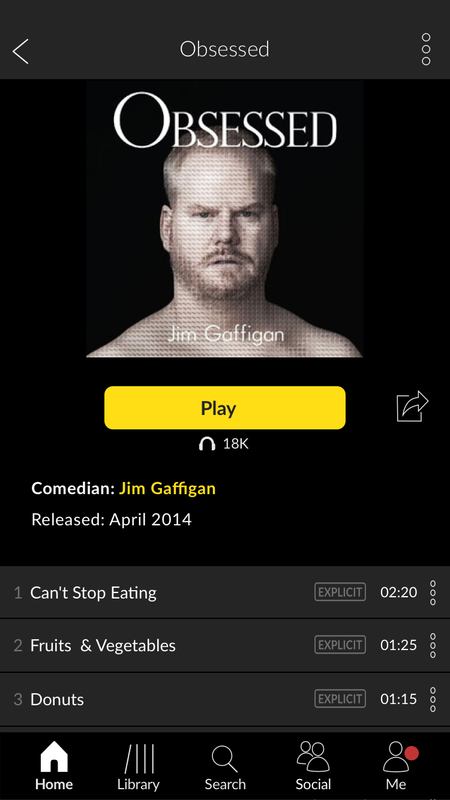 Role: Sole UX designer, visual designer, and researcher for the "Spotify of Stand-up Comedy." Using lean UX practices, I've driven feature definition and design from beta through launch, from 0 to over 250,000 users. Research Methodology: When new features needed to be designed and implemented within a month, we employed lean research practices including A/B testing, phone and in-person interviews, qualitative email and in-app surveys. "So how is it different from Spotify or Pandora?" "Does it play both comedy recordings and videos?" Through research, we realized that users were looking for value props that we were not clearly showing. The app needed to educate users on value to build trust in our new brand. Apart from knowing the top 10 most popular comedians, users were unlikely to have strong preferences like they would with music. 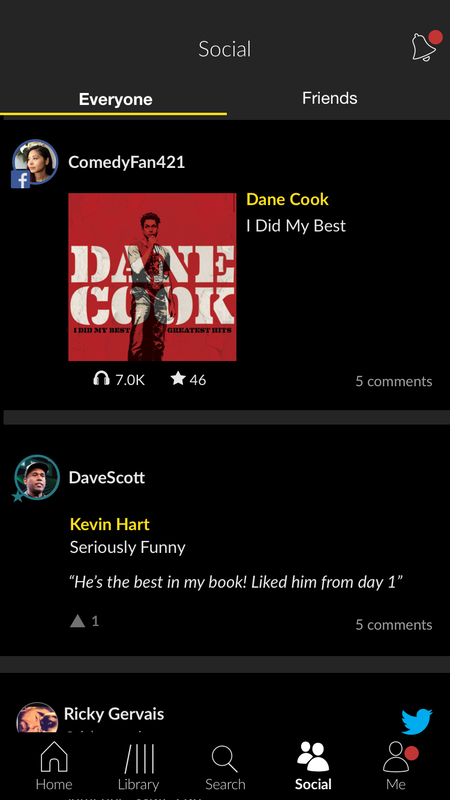 We were pairing users with comedians they didn't know they would enjoy. A recent move to a subscription-only model required a complete re-design of onboarding. With fierce competition from larger players from the market, I settled on highlighting the value props that differentiate Laughly (albums, originals, podcasts, livestreams). I wanted to stay away from short video clips since users expressed confusion around if Laughly offers video content (we don't). I designed a flow that let users into the app to play a few tracks prior to registration. Unfortunately, this didn't convert as well as the previous flow. "Nice to see familiar faces on here. Looks like it has some interesting features..."
Onboarding iterations improved free trial starts from 40% to 65%. We’re continuing to A/B test if users should be let into the app earlier, since a subscription-only app is a much bigger commitment and having a peek at our content may convince users to commit. Through an exit survey, we’re capturing reasons why users cancel. "I had no idea there's a full menu, is it not just Home?" Data showed that only 25% of users ever click on three-dot menu, which meant that new features were not utilized. Interviewed users often walked away thinking that Home was the ONLY screen. The 2nd phase was to move toward a simplified and persistent bottom navigation, increasing visibility of our main offerings, while de-emphasizing features users did not engage with often. I determined design priorities through discussions with stakeholders. "I like having all my saved and subscribed content live in one place." Home: Where we feature our best performing content, as well as our breadth of content. 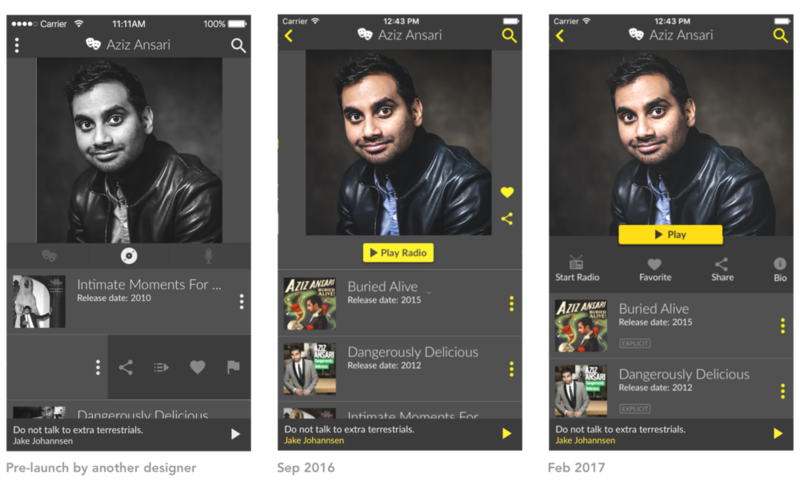 This navigation boosted engagement with podcasts and live events, and maintained engagement with albums and top 50 comedians. Figure out how to direct users toward the extensive library of emerging comedians, which is one of our differentiating value props as a company. 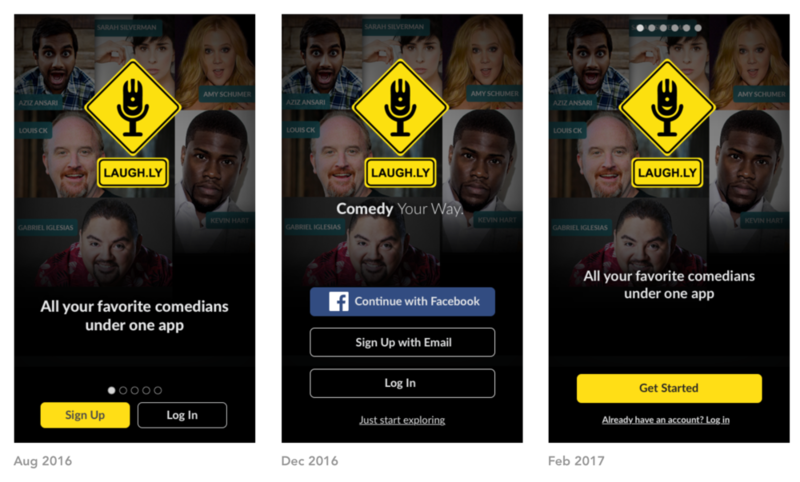 Each comedian on Laughly gets a dedicated page, a hub for an ever-increasing amount of information. Since Laughly is an entertainment app, my objective was to increase play-time, which often conflicted with new feature discovery. Progression from left to right: As we added more content and the page got longer, clutter became a bigger issue. To make room, the actions to take content (share, save, and bio) took a backseat. "I find that I often run out of content from my favorite comedians, and I'm not sure what to play next." Recently, I pushed to simplify the middle page navigation behind a menu icon, which cleaned up the look of the app as we look toward expanding functionality into playlist and queue building. It also saves us room for smaller screen sizes. We chose to prioritize the main CTA Play button above all else, even if it means pages like Comedian Bios are visited less often. 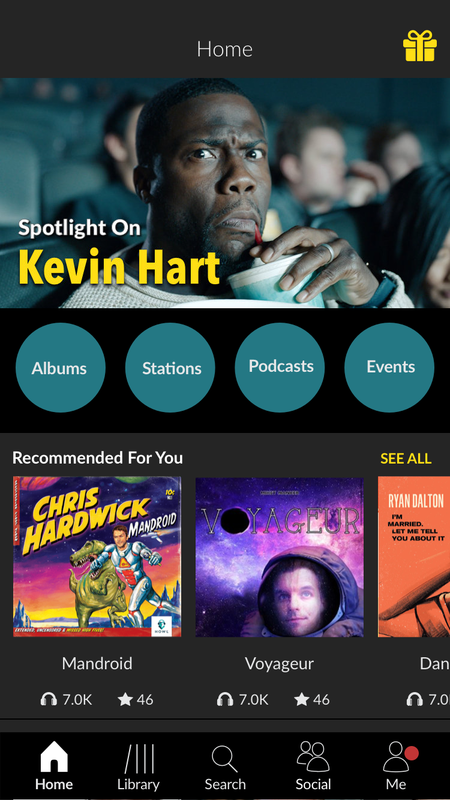 I pushed to simplify the middle page navigation behind a menu, which streamlined the app to accommodate new features like playlist and queue building. We chose to prioritize the main CTA play button, even it means pages like Comedian Bios are visited less often. Users requested quick laugh hits, so I'd like to test a version with the best performing content at the top of the page. This is tricky because comedy doesn't perform like music, and there are often no "chart-topper singles" for comedians. Evaluate how the comments feature is building community amongst Laughly users, and how to increase engagement here. Comedy is an entertainment category that users are just starting to make room in their life for. We need to conduct more research about how and why people consume comedy, and how to build more a behavior around consumption. Because of the recent switch to a subscription-only model, retention is more important than ever. Laughly must learn and recommend based on user listening history. We have enough data captured from existing users that we should be able to make recommendations even for very new users. Paid users expect a polished experience, even on older devices. We also know that Android is popular with our dedicated users in middle America, so as soon as engineering resources can be dedicated to this, I’ll start designing this.